Organised during the competition week, the Networking Forum gives the candidates who are not selected for the Finals an opportunity to be seen by schools and companies Directors from all around the world. 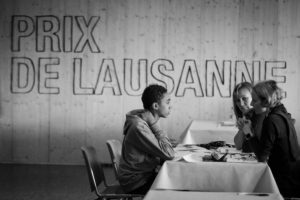 Following an audition class, interviews are organised with Directors of the Prix de Lausanne partner schools and companies wishing to recruit one or more candidates. Interviews with finalists who do not receive a prize are also arranged after the award ceremony. In 2018, 42 partner schools and companies attended the Networking Forum. Around 73 candidates participated and 151 offers were made. The results of the 2018 edition are available here! Discover the results of the 2018 edition > HERE! We came to Lausanne for the 2009 event and we had a spectacular time with all the family, and our daughter, Claudia Dean had a memorable experience too! Claudia did not go through to the final selection, however she received 7 offers to attend companies/schools from all over the world, including the Royal Ballet School in London. In the Networking class for the non-finalist candidates of the Prix de Lausanne, Mr David Peden representing the Royal Ballet School invited Claudia to attend the school. The Director of the RBS, Ms. Gailene Stock AM, later confirmed Claudia’s commencement after winning the Alana Haines Australasian Supreme Award and scholarship to the school from September 2009, and Claudia has never looked back. From her dance beginnings with Carolyn Gilby Dance Centre, a Brisbane ballet school and Prudence Bowen’s Atelier on the Gold Coast to the Royal Ballet School are quite big steps. Claudia is also the recipient of the Genee International’s 2009 Gold Medal and Audience Choice Award. Within 2 months of starting 1st year at the Royal Ballet School, Claudia was promoted to 2nd year and successfully completed this in July 2010 culminating with her first Grand Defile performance at the Royal Opera House. Claudia commenced 3rd year (Graduating year) in September 2010, and by December, was the first Royal Ballet School graduate to receive contract offers from 3 world renowned companies, including the Royal Ballet company which she has accepted. Her contract started in August 2011. I simply wanted to share this with you and say many many thanks to the Prix de Lausanne for giving Claudia the start she needed for her professional career. Our family is very appreciative of the opportunity provided by the Prix de Lausanne and we encourage other young aspiring dancers to support your event.